Holidays are the time for warm embraces, fireside escapes and something familiar to devour in quantities that you would normally be ashamed of. Unfortunately on this holiday, I am not traveling back home. No smoked turkey legs especially reserved for me, no macaroni and cheese casserole that clung together with the help of 2 pounds of cheese, and worst of all, no rolls. No rolls. No hot, buttery rolls… this is the first time in my life where I have to face the realization of those words. As the thought rolled around in my head of how to replicate Grandma’s recipe, I could not help but get caught up in the magic and memory of how it all happens. Grandma set out her “bread-making bowl,” which was an old glass Pyrex slightly scratched at the bottom, bread flour, sugar, oil, yeast, water and salt. There was a silent role call as Grandma made sure that the cast of characters was present. Slowly pouring the warm water into the bowl, she added the yeast, oil and sugar. Letting it gurgle and billow for a few minutes, she then added the salt by measuring with the palm of her hand. Slowly, she added the flour by the scoopful, stirring in between each scoop, causing the flour to puff up like tiny clouds around the base of the bowl, creating a sheer, white film of evidence around the Pyrex. Once the dough was declared ready to rise, she popped the dough into the corner of the kitchen, covering the bowl with a white tea towel and folded the towel over and under the bowl as if she were tucking it into bed. Honestly, I usually missed the rest of the steps because chatty cousins, or more likely, the dessert table easily distracted me. But, luckily, there was a clock that was built inside of me, a special timer that went off just in time for me to know that the rolls were making their début from the oven. There are many hard decisions to make in life. Scorching your mouth on hot, buttery dough just shouldn’t be a decision that one should be responsible for making. It’s a basic human right that should not be frowned upon. So, here I sit in my kitchen, overwhelmed with flour and memories, attempting the recreate my grandmother’s rolls for holidays away from home (measurements included.) Something about this small gesture makes me feel closer to my family. I pray that you and your loved ones are together for the holidays, and if not, I pray that you can feel the warmth from their hearts and hugs through familiar, heartwarming holiday vittles. *Note: The water should be warm to the touch, not lukewarm or hot, just warm like a perfect bath! Combine water, yeast and sugar together in an electric mixer fitted with a hook attachment. Let the yeast start to bloom and froth for about 5-10 minutes. Add 1 stick of melted butter and 2 tablespoons of salt to the mixture. Mix to combine. Add 3 cups of flour to the mixture and combine on low for just a minute. Add the remaining flour and mix until the dough begins to form in a ball. Transfer the dough to a greased bowl and let sit for 1 hour in a warm spot (or until doubled in size.) Punch down the dough and divide into 12 equal pieces. Coating your hands with flour, form each piece into a ball and place into 2 greased pans (I used 2 8-inch cake pans.) Cover and let rise for 1 hour. 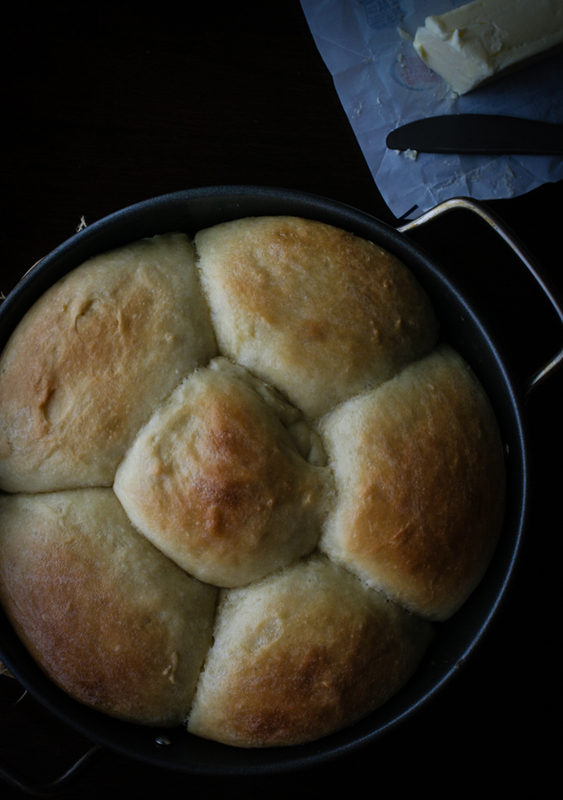 Uncover the rolls and brush the tops lightly with butter. Bake the rolls for 20-25 minutes or until golden brown on top. Once the rolls are out of the oven, brush with more butter and, with a fork, pick up the sides of the rolls for a few moments to allow the steam to escape (this ensures that your rolls with not get soggy!) Enjoy! AW! I will miss you so much and I’m so sad that you won’t be with us this holiday 🙁 I’ll eat a roll and some turkey for you! I hope you have fun anyway!! 🙂 love ya! I know! It’s sad to spend this holiday without ya’ll for the first time! Awww! I’m sorry Kaitlyn. I know she will be missed on your side… but happy, happy, joy, joy that we’ll get to embrace her wonderful self this year! I will be more than happy to make A. some ooey gooey mac & cheese if it that would make it better. Oh that sounds wonderful! And her rolls are VERY hard to beat and will be missed dearly! LOVE these, It’s cool to watch you make the rolls that we’ve grown up with. Grandma always, without doubt, will have rolls on the counter hot and fresh. So to have my sister make these and make them taste like Grandma’s is amazing. You make these as if you’ve been making them for 40 years! You’ve got that thing. Thanks! Major compliments! She has been making them since she was a teenager and has completely perfected her recipe! It’s an honor to carry down this tradition. Oh thank you so much! I hope that you have a happy Thanksgiving as well! I started making dough young enough with my grandmother so she took that intimidation factor right out of me with concerns with dough! Love you!